DN – Los Angeles is changing the way it does parking in Downtown. They’re calling it the ExpressPark system. Let’s start with the basics, what is the program and what are your thoughts? DS – For the first time the city is stating exactly how it will set parking meter rates. Instead of basing the meter rates on emotions or political pressure, the city has established a principle. The city will set the lowest price that will leave one or two open curb spaces on every block. In effect, the city has said, “Here’s the rule. If half the spaces on a block are empty, we will lower the price on that block. If all the spaces on a block are full, we will raise the price on that block. If one or two spaces are open, we will leave the price unchanged.” This is the Goldilocks Principle of parking prices. If the price of curb parking is just right, then the curb spaces will be well used because almost all the spaces will be full. Yet spaces also will be readily available because one or two spaces will be open. Can anyone suggest a better way to set the right price for curb parking? You cannot set the right price without looking at the results. DN – This marks a shift in policy for the city that seemed to base their parking decisions based on what brings in the most revenue. DS – Meter rates were based on revenue when the city doubled meter rates everywhere, with a minimum $1 an hour, two years ago. Since most meters had been 25¢ an hour, that meant quadrupling the price at most meters. Rates at most of the city’s meters had not changed at all in the previous 18 years. Inertia had been the city’s policy, not maximum revenue or good management. There’s been a lot of neglect of parking meters. Inertia seemed to be the main factor in determining parking prices. They’re changing that by saying, “Here’s the rule. If half the spaces on a block are empty, we’re going to lower prices. If all the spaces are full we’re going to raise prices.” Since the price change two years ago, I’ve seen entire blocks where there isn’t one car parked. The price is too high. I think a lot of prices would go down if they extend express park to the whole city. They’re starting in Downtown, but I suspect that some prices will go down. The Times took a poke at ExpressPark in a recent editorial cartoon. Check it out by clicking on the picture. DN – One of the tenets of The High Cost of Free Parking is that money collected from meters should be returned to the communities where it was collected. L.A. pours all the meter funds into the general fund. Is that a mistake by the city? Does it give you any misgivings about the plan altogether? DS – Pouring all the meter revenue into the general fund is a mistake. If the city returns some of the revenue to the metered neighborhoods, it can get both local buy-in and some wonderful results. Pasadena returns all of its meter revenue to pay for added public services in the metered neighborhoods, and Old Pasadena is a good example of the benefits. Old Pasadena was until the 1980s a commercial skid row and now it is one of the most popular shopping destinations in Southern California. Parking meter revenue helps to explain that success. The meters, which were installed in Old Pasadena in 1993, bring in $1 million a year to spend on in added public services in just that little shopping district. The meter money paid to replace all the sidewalks, streetlights, street trees, and street furniture. It paid to clean up the alleys and put electric wires underground. The meter money also pays to pressure wash the sidewalks twice a month and to provide added police services. If LA adopted Pasadena’s parking meter policy, all of our business districts would be much more prosperous. Residents of LA would not have to go to Pasadena or Santa Monica or Culver City to walk around in clean and safe environments. DN – San Francisco has a program similar to ExpressPark. How is it working? DS – San Francisco started its program, called SFpark, this year and last month it made the first price adjustments based on occupancy rates. Prices stayed just the same for 37 percent of the meters, increased for 32 percent, and decreased for 31 percent. A journalist called me and said, “I don’t understand this. The price is going up on one block and going down two blocks away. The price is going to change from block to block.” My answer was that if one block has only half its spaces occupied, do you think the city should not lower the price on that block? Most people would probably agree with a lower the price. But if a block is always full of parked cars, why should the city not raise the price on that block? I think there’s going to be some trial and error in setting the prices. People should wait to see the results before they denounce Express Park. DN – Do you think drivers will be confused if meter rates are different on different blocks in downtown? DS – Drivers should be able to deal with this. Just as they can deal with gasoline prices that are different at gas stations that are on different blocks. Prices are different for different grades of gasoline and some stations have different prices for full service self service, and drivers are not confused. So I don’t think drivers will be confused if the cost of parking is different on different blocks. If people are willing to walk farther from their parking spaces to their destinations, they can save money and get some exercise. DN – While the prices on the meters are going to change based on the price of day, the Times reports that the city will only change rates once a month. Is that enough? Should they be changing it more often? DS – I think the city is wise to start modestly and see what happens each month. San Francisco has three different price periods: before noon, noon to 3 pm, and after 3 pm. If it becomes apparent that there are different occupancy rates at different times within the existing periods, they may extend the meter hours or have more fine-grained price periods. DN – Are there any roadblocks in other cities that you think the city should look out for? Anything we can learn from other cities that have tried this? DS: The main problem we already have in L.A. is the widespread abuse of handicapped placards. A disabled placard in California is like a “free parking” pass for the entire state. One of our students just finished his Masters thesis on placard abuse in downtown. 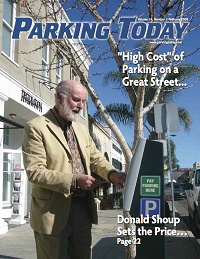 He surveyed one block on Flower Street where there are 14 metered parking spaces. Most of the spaces were filled most of the time with cars that had disabled placards. For five hours of the day, all fourteen spaces were occupied by cars with disabled placards. Although the meter rate was $4 an hour, the meters earned only 32¢ an hour in collections because most of the time the meters were occupied by cars that paid nothing. There’s a terrific financial incentive to abuse disabled placards as a free parking passes. Raising meter rates will further increase the incentive to abuse placards. I think the city ought to have more frequent stakeouts to observe cars with placards and ask drivers when they return for the identification that comes with the placards. One city, Alexandria VA, did that because they are thinking of ending free parking at meters for placard users. The police staked out a sample of cars with placards parked at meters and found that 90 percent of the drivers were illegally using the placards. Some people are willing to cheat the system because they’re not willing to pay for parking. TV reporters and Los Angeles Times reporters have often interviewed placard abusers who are quite shameless, often complaining that the meters cost too much. The city ought to do more to penalize people who abuse placards. DN – We’ve talked a lot about the concerns of individual drivers, but what about the businesses? Do businesses have something to worry about? DS – If ExpresPark achieves the desired result of one open space per block, then it should help businesses. If parking prices are too high, and there are too many vacant spaces, then businesses lose customers, the employees lose jobs and the state loses sales tax revenue. If the prices are too low, and there are no vacant spaces, everyone says “It’s impossible to park!” Drivers cruising for cheap curb parking congest traffic, waste fuel, pollute the air, and interfere with pedestrians and cyclists, and that makes it even harder to stop and shop there. There’s another reason why ExpressPark will help businesses. Buses can get mired in traffic congestion caused by drivers who are cruising for underpriced curb parking. When the bus service slows down, some bus riders will start avoiding the downtown altogether. If ExpressPark works the way the city intends, and there are one or two open spaces per block, everybody can win. There’s another feature of ExpressPark that can help traffic. In San Francisco, when there will be a special event, such as the Gay Pride Parade, that draws a lot of people in cars, they can raise the price of parking on adjacent streets on that day only, to prevent cruising. You don’t want to charge less for on-street parking than off-street parking during these events because that underpricing creates the incentive to cruise for the the curb spaces. DN – Like with congestion pricing, there’s an argument that ExpressPark is bad for people of lesser means. The poorest people can’t afford cars, and they won’t pay anything for Express Park. Their lives will improve because the city will have more money to pay for public services and the bus system will run better. The buses that they ride in won’t be mired in traffic caused by cars cruising for parking. DN: Professor, thank you so much for your time. DS: Thanks, it was fun talking to you. Look, I really support ExpressPark. I support charging based on free-market/supply-and-demand principles. However, there’s a big problem with the program: Handicap placards. When seven out of nine spaces on a block (or six out of eight, four out of five) are taken up with cars that have handicap placards on them, there’s a big problem. You no longer have supply-and-demand because those vehicle owners don’t have to pay to park. They can park all day long for free. Instead, you’re making everyone else pay more because of this artificially created demand. Don’t get me wrong, I completely support a smart handicap placard system for the elderly, physically disabled etc. But when people are getting handicap placards for being overweight, for having diabetes, or for depression (I work with someone who constantly talks about the “benefits” of depression – swear to God) and for using their elderly parents’ placards when running their own errands… we no longer have fairness, nor do we have a solid foundation for “ExpressPark.” Why would an employee pay for garaged parking all day when they get to park for free on the street? We have an entitlement society run amok, with the last few taxpayers having to foot the bill for those who would take, take, take as much as they can. Next time you have a chance to walk around Downtown, why don’t you take a look at how many blinking red lights there are for people who get to park for free. It’s been eye-opening. That’s actually a pretty good point. If any (not-tiny) population can park here for free it really messes up the system. Though actually, maybe we could just buy out the parking spots and make bike lanes, which is what ought to happen anyway. This free market the GOP loves so much will provide parking garages at the rate people are willing to pay. Wow. In Massachusetts to get a disability placard your doctor has to certify that you cannot walk 200 feet without stopping to rest. (Or suffer from a specific disability, and then only at Stage III or IV of the disease.) The placards have a photo ID on them. Using someone else’s placard is an automatic 30 day license suspension and a $500 to $1000 fine. TV stations and newspapers ran exposes of people abusing handicapped parking. They really are scum and there was huge support toughening the law. There is even an online form to report suspected abuse. Uh, Damien, you are aware that would actually be the most efficient policy, right? If you’re trying to maximize revenue, you don’t set prices so high that people won’t pay them, but you also don’t set prices so low that there is a shortage. Setting the price so that almost all the spaces are filled up, but there are still a few spaces available for people looking to park (no shortage) will bring in the most revenue. I was wondering if SFMTA plans at some point to convert all of its meters to smart meters. Could anyone clear up that point for me? Thanks. I ask, because in my nearest shopping areas (Polk Street, North Beach, and Chinatown) I haven’t found any smart meters. In the Polk area, for example, there are so many empty parking spaces in the mornings and yet the cost is still about $2/hr. Clearly, it could be lower and bring in more auto-based business for the local merchants. Yet in the evenings after 6 pm those metered spots are full and I can’t use the area to go out, unless I walk/bike. While that’s ok by me most nights, it’s not okay with my wife sometimes, and certainly not when there are six of us going out. A lot of guest don’t want to climb up a steep hill late at night after a meal. So we tend to drive together someplace more accessible. Again, the local merchants are losing business because people aren’t paying a dime for their parking in the Polk area after dark. The same is true for North Beach, etc. I would like to have the option of driving sometimes in the evening, finding open spots, and paying for them. I don’t think raising the price of parking is going to have any effect whatsoever on cruising during the Gay Pride Parade! At least one hopes not.